The Government Accountability Office (GAO) is required to audit financial statements for the U.S. government each year. What the GAO found in its Fiscal Year 2012 Audit published on January 17, 2013 is clearly unacceptable. If you take a few moments to read the report, what you’ll discover is that not only has the U.S. government been operating without a budget for the last three years, but even worse its books and records are so out of order that financial auditors were unable to render an opinion. You can bet that all the major credit rating agencies are paying attention and will render an opinion when judgment day arrives, and that day should be right around the corner. Following are some highlights from the latest report (in italics) along with a brief commentary. Based on the auditor’s inability to express an opinion on the federal government’s financial statements, it is my opinion that any request to raise the debt ceiling should be summarily denied. 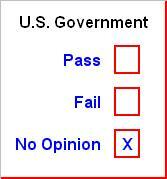 Were the federal government a private entity, its creditors would be cashing out now and asking questions later. But since the federal government has a seeming unlimited ability to borrow without ever reducing its debt principal, perhaps my personal perceptions are overly rational. Then again, any decision based upon uncertainty or unreliable information can later come back to bite. If the federal government’s financial statements are so unreliable that auditors are unable to express an opinion, my gut instinct is to limit exposure, cut losses and move on. The Department of Defense (DOD) is no longer the largest drag on the federal budget; the Department of Health and Human Services (HHS) came in at number one last year, while the Social Security Administration (SSA) clocked in at number two, responsible for 23% and 22% of net federal costs, respectively. DOD now represents the 3rd largest item in the federal budget, consuming 21% of the government’s $3.8 trillion in net costs for FY 2012, yet its financial statements are currently not auditable. That means we really have no idea what DOD is buying, what it already owns, or the true nature of its future liabilities. Further, according to GAO, most of the increase in DOD’s cost during FY 2012 was attributed to its Military Retirement Fund and other benefits programs. Since at the same time, the bulk of HHS and SSA costs come from major social insurance and postemployment benefits programs administered by those agencies (e.g., Medicare for HHS, and Social Security for SSA), that means better than 50% of federal spending (more than $1.9 Trillion) is directed towards retirement security, medical care, and other social welfare programs, which technically account for the entire $1.3 trillion shortfall realized by the federal government in FY 2012, and then some. The national debt is comprised of debt held by the public and intragovernmental holdings. Intragovernmental holdings are debts the federal government owes to itself, a phenomenon only possible within the realm of the criminally insane. For example, as of the end of FY 2012, the Treasury has borrowed a total of $2.7 trillion from the Social Security Administration (its entire Trust Fund), and more recently from federal employee pension funds in order to meet its unmanageable over-inflated obligations. The total debt outstanding has grown from $5.7 trillion at the end of fiscal year 2000 to $16.4 trillion as of January 17, 2013. Included within this figure, intragovernmental debt has grown from $2.3 trillion at the end of fiscal year 2000 to $4.9 trillion as of January 17, 2013 (see table below). As if the sheer weight of its total debt isn’t bad enough, according to GAO, the federal government can no longer adequately account for and reconcile its intragovernmental activity or the balances owed between federal agencies. Here’s an example. Back on June 28, 2010, the United States Postal Service, Office of Inspector General (OIG) discovered that the Postal Service had made a $75 billion overpayment to the Civil Service Retirement System (CSRS). However, since according to Note 24 of the GAO report (page 120), the Civil Service Retirement and Disability, and Civil Service Health Benefits Program Trust Funds are currently $849.1 billion and $240.0 billion in the hole, respectively, why would CSRS care? Let’s make this clear. Prior to 1917, Congress approved each and every debt issuance request made by the Treasury Department. It was with the outbreak of the 1st World War that a debt ceiling was first established. This gave the Treasury some latitude in keeping the government afloat without impairing wartime activities. So it would make sense that after the end of World Wars I and II, Congress would resume its role of approving each debt issuance. But instead, the U.S. government has morphed into a permanent war mentality. Now, a small minority of borderline insane pundits are actually advocating for complete removal of any form of debt ceiling. It’s World War Infinity, they surmise. Like spoiled little children, they have conned themselves into believing that the role of government is to borrow and spend our way into a utopian entitlement paradise. Where are the adults? While a minority within the realm of the spoiled and irresponsible are vying for total removal of any limits on the national debt, we have just been informed that the federal government has no control over improper payments, no ability to manage information security risks, cannot effectively manage its tax collections, and is unable to effectively monitor and report its loans receivable and its ballooning loan guarantee liabilities. It seems to me that the federal government should get a grip on its internal infrastructure before another dime is borrowed or spent. However, even if the federal government were able to show improvement in these areas, there are other issues on the horizon threatening to derail its entire operation. The U.S. Postal Service (USPS) is facing a deteriorating financial situation as it reached its borrowing limit of $15 billion in fiscal year 2012 and finished the year with a reported net loss of almost $16 billion. The Federal Housing Administration (FHA) reported that its liabilities exceeded its assets by about $15 billion as of September 30, 2012, and that the capital ratio for its Mutual Mortgage Insurance Fund fell below zero during the fiscal year. In addition, the ultimate roles of Fannie Mae and Freddie Mac in the mortgage market may further affect FHA’s financial condition. Several initiatives undertaken during the last 4 years by the Board of Governors of the Federal Reserve System to stabilize the financial markets have led to a significant change in the composition and size of reported securities on the Federal Reserve’s balance sheet. The value of these securities, which include mortgage-backed securities guaranteed by Fannie Mae, Freddie Mac, and the Government National Mortgage Association, is subject to interest rate risk and may decline or increase depending on interest rate changes. Therefore, if the Federal Reserve sells these securities at a loss, future payments of Federal Reserve earnings to the federal government may be reduced. The USPS, FHA, and Federal Reserve are in over their heads, and either technically bankrupt, or soon to be. Yet, the only answer proffered by our so-called leaders in Washington, DC is to keep borrowing. Is this really the only viable solution? The Post Office borrowed $15 billion and then lost almost $16 billion last year. Does that sound like an entity worthy of another loan? Not in my world. It seems to me that instead of continuing to prop it up, it’s time for the USPS to go the way of the dinosaurs. The FHA and Federal Reserve can follow suit. The federal government’s consolidated financial statements as of September 30, 2012, include approximately $109 billion of investments in two government-sponsored enterprises—the Federal National Mortgage Association (Fannie Mae) and Federal Home Loan Mortgage Corporation (Freddie Mac) (reported net of about $85 billion in valuation losses). In addition, as of September 30, 2012, the financial statements include about $9 billion of liabilities for future payments to Fannie Mae and Freddie Mac and disclose a projected maximum remaining potential commitment to these entities of about $282 billion under agreements between Treasury and the entities. The future structures of these two government-sponsored enterprises and the roles they will serve in the mortgage market must still be determined. The federal government reported Troubled Asset Relief Program (TARP) direct loans and equity investments of approximately $40 billion as of September 30, 2012 (reported net of about $23 billion in valuation losses), of which approximately $20 billion related to loans to and equity investments in certain entities in the automotive industry. The federal government reported that the Pension Benefit Guaranty Corporation’s (PBGC) liabilities exceeded its assets by about $34 billion as of September 30, 2012. PBGC is subject to further losses if plan terminations that are reasonably possible occur. In other words, the federal government “invested” $109 billion into Fannie Mae and Freddie Mac, which resulted in $85 billion in valuation losses, yet it plans to invest another $291 billion going forward. Another $63 billion was invested in loans made to TARP, which reported $23 billion in valuation losses ($20 billion of which is attributable to loans made to the auto industry). And the PBGC’s liabilities now exceed its assets by around $34 billion and it may be subject to further losses going forward. And what’s the federal government’s solution? Raise the debt ceiling, borrow more, and keep propping up failed entities, otherwise it fears the whole house of cards may come crashing down. Perhaps it’s time to get real and just go ahead and begin dismantling the entire criminal enterprise, one failed agency, entity and fund at a time. The GAO was not able to express an opinion on the U.S. government’s financial statements, but that doesn’t stop us from reading between the lines. Either we deal with our fiscal problems now, or later. Leaving my granddaughter’s a legacy of failure is not something I’m willing to support. It’s time to grow up, and demonstrate it by cutting the federal government down to its bare bones. Do this today and we might have a chance; wait until tomorrow, and according to GAO, the U.S.A.’s debt-to-GDP ratio will reach 395% by fiscal year 2087 and rise continuously thereafter. If Congress raises the federal government’s debt ceiling without fundamental fiscal reform, then we all deserve everything we’ve got coming to us, nothing. Until such reform takes place, government ilk can count me out. Don’t call me, don’t write me, don’t ask me to invest in federal debt issues, and don’t dare ask me for another dime. Comments are on Free Republic.